A country of unique features and contrasts it has the eighth largest land mass in the world (over 1 million square miles), some of the highest mountains (Aconcagua, 22,834’), it is three times as long (north to south) as its widest point (870 mi), glaciers, deserts, mountains, and plains. Argentina is a thoroughly modern country with European influences, a relatively high level of per capita income, and one of the highest literacy rates in the world, at 97%. The total population is 38 million, a whopping 35% of who live in the capital city of Buenos Aires. Argentina has a number of fascinating facts relative to its wine culture, such as growing grapes at the highest elevations in the world (as high as 9,800’ in Colomé), and at the lowest latitude, 43° in the Patagonia province. Argentina’s wine culture was well established long before many other new world wine regions. Sixteenth century Spanish missionaries and conquistadores brought their favorite vines over with them as they explored and settled in South America. Malbec is the red grape most associated with Argentina. 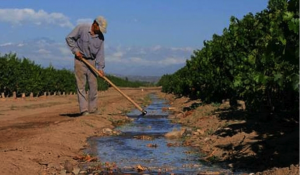 It found more favorable growing conditions in Argentina than its native Rhone region of southwest France. Known for its firm tannins, purple hues, plum flavors and licorice and spice notes Malbec is the perfect complement to the diet of red meats so prevalent in Argentina. Malbec in Argentina is also able to grow in its unadulterated, un-grafted state. Imported long before the phylloxera epidemic that devastated Europe’s grapevines, causing most of Europe to remedy the situation by grafting American rootstock onto native vines. Ever vigilant, on the lookout for any first indications of the dreaded phylloxera louse, many Argentine winegrowers plant rose shrubs at the ends of rows to be a warning beacon. 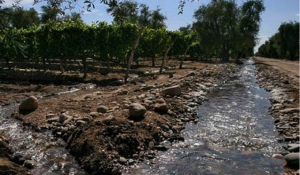 The arid, desert/mesa climate with low humidity and annual rainfall amounts, combined with the prevailing winds naturally protect Argentina’s vines from the overuse of sulphur, pesticides, and various other treatments found to be necessary to ensure a good crop elsewhere in the world. Up until the 1970’s Malbec was referred to locally as “the French” grape. Quality was not the key factor in production and consequently it was over-planted. Argentina is the fifth largest wine producing country in the world, with over 540,000 acres under vineyard cultivation. Untils the 1990’s not much of that product found its way out of the country. Winemakers had not paid much heed to the export markets and the wine remained relatively unknown to the rest of the world. All of that changed back in the 1990’s when the country’s own internal financial struggles forced Argentina’s winegrowers to experience a fundamental shift from quantity output to quality wine production. Vines were ripped out, yields were controlled, and attention was paid to which clones were oenologically superior. Argentina is now more export-oriented and one of hottest value wine regions in the world. Their wines enjoy an excellent quality to price ratio and are extremely food-friendly. Malbec is not the only wine of quality grown in Argentina, though it does seem to currently enjoy a singularity of association. This country is no one trick pony in the wine world. Torrontes is the native white grape of Argentina. It is a natural combination of the Muscat de Alejandro, and the Mission grape, known locally as the Criolla Chica, brought over from Spain by 16th century conquistadores and missionaries. There are three variations on the Torrontés grape: Torrontés Riojano, the most common, Torrontés Sanjuanino, and Torrontés Mendocino. There is almost no other wine-growing region in the world cultivating this grape, though recently some can be found in Spain and New Zealand. Keep an eye on this grape because it is poised to become perhaps the next high demand white wine. The flavor profile of Torrontes is similar to a Gewurztraminer or Viognier. You get a lot of gratification from this wine long before it ever reaches your lips. 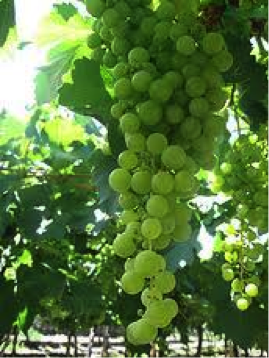 It is one of the aromatic grapes, with heady, intense floral aromas of orange blossoms, jasmine, and lavender, and tropical fruits from orange, lemon, lime, and grapefruit, to honeydew, apricot, lychee, and apple. There is often a spice note like white pepper, or a minerality picked up from the sandy, stony soils. Torrontes is grown predominantly in two of Argentina’s wine regions, the North, and the Cuyo or Mendoza region in the central western part of the country. In the north the Cafayate Valley in the Salta province is a key place to find Torrontes. The wines here are often leaner, and crisper, with higher acidity. They grow at the highest altitudes in the world, over 5,600’ on steep slopes where furrows are dug to naturally irrigate the vineyards via snow melt coming down from the Andes Mountains. The average rainfall in Argentina is only 8” per year and with extremely permeable soil it is crucial to capture this mineral rich snow melt water. 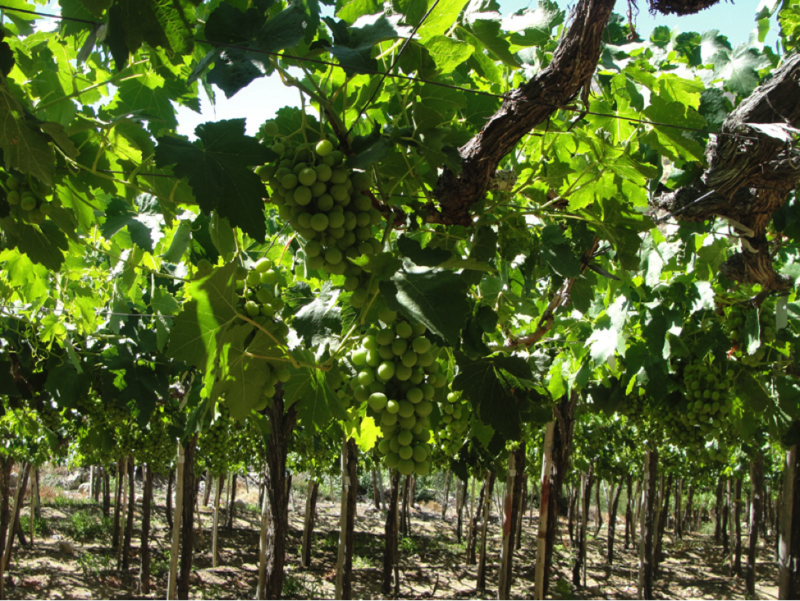 In the Mendoza or Cuyo region the elevation is much lower, 1,000 – 2,000’ and the soil is more fertile, though the climate is more arid, and desert-like. The wines from this region tend to be fuller and rounder, with more intense flavors. An often-employed trellis system used in Argentina is the traditional Spanish parron. This trellis utilizes a series of overhead wires and support beams. 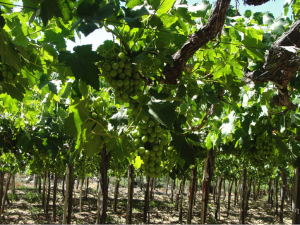 This style of trellising allows for easy access to the clusters during harvest with full exposure for the foliage and good air circulation throughout. I had to taste a few wines to get a feel for the varietal and its expression from the different regions. So I hosted a tasting party with some friends, most of whom don’t know much about wine beyond whether or not they like what’s in their glass—and in the end that is all that really matters about the wine anyway. All of the wines were in the value sweet spot of from $9 to $15. These kinds of tasting parties always go well because even the newest wine enthusiast can confidently identify many of the more prevalent aromas. Torrontes is also a food-friendly wine, pairing well with a large variety of white meats, seafood, and poultry. Spicy Asian-influenced dishes and salads with vinegar-based dressings also do well with a Torrontes. It is a great alternative wine to the more widely known Chardonnays, Pinot Grigios, and Sauvignon Blancs of the world. 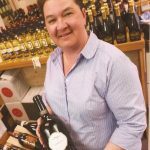 Lorie’s experience includes working for an Italian wine importer and as a consumer wine consultant. She is a member of the Society of Wine Educators, studying for her CSW. She writes about wine at her WiningWays Wine Blog with a focus on tourism marketing and championing New England wines. She also hopes to help change the direct shipping laws in the state of Massachusetts.